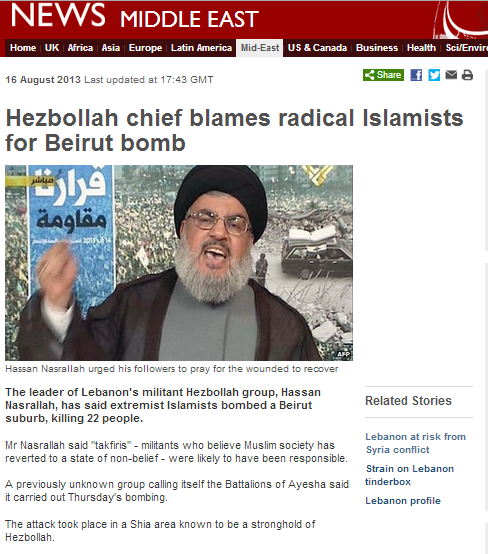 On August 16th 2013 the BBC News website carried an article on its Middle East page now titled “Hezbollah chief blames radical Islamists for Beirut bomb“. “The leader of Lebanon’s militant Hezbollah group, Hassan Nasrallah, has said extremist Islamists bombed a Beirut suburb, killing 22 people. Mr Nasrallah said “takfiris” – militants who believe Muslim society has reverted to a state of non-belief – were likely to have been responsible. A previously unknown group calling itself the Battalions of Ayesha said it carried out Thursday’s bombing. “The leader of Lebanon’s militant Hezbollah group, Hassan Nasrallah, says radical Sunni Muslim militants bombed a Beirut suburb, killing 22 people. Mr Nasrallah’s Shia group supports the government of President Assad in the civil war in neighbouring Syria. As we see, all references to “Sunni radicals” and “Sunni Muslim militants” have been removed in the amended version of the article. That term is generally used to describe extremist Sunnis – as pointed out for example in this article about the same Nasrallah speech from Reuters. The term is certainly used in that sense by the Iranian regime and the media it controls, by the Syrian government and its media and by Hizballah. All three of those elements promote the notion of an alliance between the United States, Israel and ‘takfiris’ aimed at deposing Assad. “…U.S. and Israeli intelligence agencies had “undoubtedly” managed to infiltrate takfiri groups, which he added were now working to serve Israel’s interests. “The events in the last couple of years have proved that there is an axis lead by the United States while the rest are working under its orders. Everyone knows this axis is supported by Israel while al-Qaida and other Takfiri organizations from around the world were paid to take part in it,” he detailed. Of course the conspiracy theory of a US/Israel/Al Qaida-affiliated jihadists alliance to take over Syria sounds to most observers exactly like the fairy-story it is, but the promotion of that conspiracy theory has an ulterior motive: the deflection of criticism from both home and abroad of Hizballah’s Syrian adventure. Not by chance then do we see Hizballah’s Al Manar media organization seeking to defuse domestic criticism of the violence plaguing Lebanon as a consequence of Hizballah’s involvement in the Syrian civil war by stressing the point that Nasrallah stated in that speech that the “takfiris” are not Sunnis. Significantly, Nasrallah also declared the ‘takfiris’ not to be rather a lot of other things too, putting the “not Sunnis” remark in its proper context. “In this context, Sayyed Nasrallah pointed out that the goal of these Takfirists is to stir up sectarian incitements among Lebanese, calling upon the Lebanese people to be aware of that. He further stressed that those terrorists did not belong to the Sunni sect. Now, as we see, the BBC has amended its original article on Nasrallah’s speech to conform with the Hizballah public relations campaign to portray it (and in a wider context, Hizballah’s Syrian campaign too) as ‘non-sectarian’. The person taking credit for that change on Twitter is one Miqdaad Versi who appears to have something of a penchant for Hizballah’s former ‘spiritual mentor’ Mohammad Hussein Fadlallah. The BBC’s willingness to make an unnecessary correction to this article, based on an overly literal and politically motivated interpretation of the words of the leader of a terrorist organization which has its very existence rooted in sectarianism, certainly does not inspire confidence in the BBC’s ability to fulfil its task of enabling audiences to “build a global understanding of international issues”.